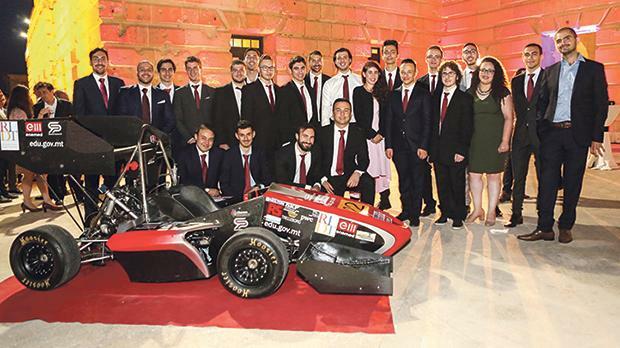 Malta’s Formula Student Team – University of Malta Racing – last Sunday unveiled their race car that will compete in the 2018 Formula Student Competition. The competition will be held in the Silverstone Circuit in the UK later this month, bringing together teams from some of the best universities around the world. This year, the team made a number of improvements to various parts of the car, including a redesigned turbocharger set-up, a lighter pedal box and a new electronics system. The most visible improvement is the application of an aerodynamic package which had been in the research phase through eng​​ineering final year projects in the past years. This will be Malta’s fifth entry in a Formula Student event, following successful attempts in 2007, 2014, 2015 and 2017, but will be the first time that the team itself will attend the UK competition. Besides the team’s faculty advisor Dr Maurizio Fenech, the project is being supported by the University of Malta, its Research and Innovation Development Trust (RIDT), the Ministry for Education and various other sponsors and collaborators. For further information and updates visit the link below.